Just as Chinese herbal shops and herbal remedies have changed little since the Song and Ming dynasties, Chinese physicians have also continued to practice their ancient healing arts according to the traditions and standards established by their forefathers in the field. Such great Chinese physicians as Hue Tao, Sun Simian and Li Shushed of the late Han, early Tang and Ming dynasties respectively, would have felt very much at home in the clinics of some modern day practitioners. Contemporary Chinese doctors have found little use for most of the therapeutic chemicals and equipment found in the typical Western clinics. They do, however, combine some basic Western diagnostic techniques, such as X-rays, blood pressure, blood and urine analysis, etc., with their own traditional diagnostic methods. One of our examples of contemporary Chinese physicians, of the Confucian tradition in Chinese Medicine, Hung Shui Chen who has conducted a small clinic in Kaohsiung Southern Taiwan, for the past 60 years. He is a master of the traditional Chinese massage method called “push and rub”, Tuina, which he combines with acupuncture, Chinese herbal poultices, internal herbal preparations, direct moxabustion and medical Qi Gong. His patients come from all walks of life – high government officials, housewives, businessmen, American investors, Chinese secretaries, Arabian oil-sheikhs and local taxi drivers. The walls of his clinic are covered with framed letters from his patients, expressions of effusive praise and heart-felt gratitude. Like the great Tang physician Sun Simiao, Dr. Hung has refused many lucrative offers to become personal private physician to ailing men of great wealth and power. He prefers instead to remain in his humble clinic and fulfill his sacred obligation to his many patients. One, a wealthy Lebanese tycoon who suffers from a painful chronic sciatic condition, offered to pay his round trip fare first class between Kaohsiung and Beirut, plus a fantastic fee, to treat him at his home in Beirut for a month. Citing the many patients who rely daily on his “benevolent heart, benevolent art”, the benevolent doctor politely declined. So, the tycoon flew to Kaohsiung and Dr. Hung treated him in his suite at the Hilton Hotel after closing up his clinic at night. Hung Shui Chen is a native Taiwanese whose family has been practicing Tuina massage, acupuncture and Herbal medicine for several generations. Asked what the main sources of his profound knowledge and exceptional skill were, he replied, “My family and my own experience”. He holds all the necessary government licenses to practice Chinese medicine but insists that these are mere formalities. Difficult as the Chinese medical examinations are, passing them only proves that one has mastered the theories and memorized the mass of medical and herbal terminology required to practice the art. Skill, insight, clinical experience, special techniques passed from master to apprentice, and a refined personal touch combine to elevate an ordinary doctor to an exceptional one. Hung Shui Chen recommends internal herbal prescriptions and properly balanced diets as complementary supplements to his external therapies of Tuina massage and herbal poultices. It is not uncommon for Chinese doctors to develop remedies based on their own clinical experience and interest. Dr. Hung is certainly no exception to this practice; the herbal poultice he applies after massage evolved in this way and contains 16 herbal ingredients. It is highly effective in cases of rheumatism and arthritis, strained backs and sprained joints, sciatica and other nerve disorders, twisted tendons, and pulled muscles, energy and blood stagnation’s, bruises and abscesses, wind-chills, and other related conditions. An elderly American woman on tour in Kaohsiung was once brought to him for treatment of acute, unbearable pain resulting from a sudden flare-up of a pinched nerve in her spine, which had plagued her for over 20 years. Her Western prescribed treatment for this condition for the past two decades was a bottle of powerful painkillers: “take two or three for pain”. This time, however, even these did nothing to alleviate her misery. She was prepared to cancel her trip and return to New York on a stretcher under sedation when a Chinese acquaintance insisted that she try Dr. Hung. After her first treatment, she felt so much better that she decided to stay and complete her tour of Taiwan. After her second Tuina massage and herbal poultice, she burst into grateful tears before the doctor and said, “It’s a miracle”. She vowed to return to Taiwan for further treatment. More recently, the doctor has developed his own secret prescription of herbal ingredients to be taken internally as an herbal broth for relief of the same conditions he treats with massage and poultice. The internal and external herbal treatments work together to eliminate the painful symptoms and correct the causes of the conditions mentioned above. The potion is so effective that other Chinese doctors suffering from these ailments visit Dr. Hung to obtain relief with his magic elixir. It is common practice for Chinese physicians to visit other renowned doctors as patients, first of all to seek relief for ailments in which other doctors specialize, and secondly to obtain samples of secret prescriptions in hopes of duplicating them. For example, Dr. Hung who recently suffered from a stubborn liver inflammation paid several visits to a Taiwanese doctor whose secret herbal remedy for serious liver ailments was reported to be extremely effective. Liver ailments are particularly difficult to “cure” completely. “The poisons were quickly driven out of my liver and brought to the surface by the prescription. My skin was mottled, itchy, sticky and smelly for several weeks during the treatment and then I was completely cured”. He reports. So impressed was Dr. Hung with the quick effective cure that he has begun the long and arduous task of deciphering the prescriptions secret formula. 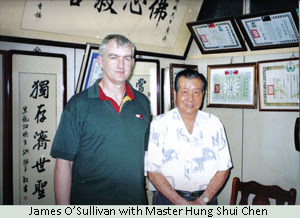 Professional physicians like Hung Shui Chen maintain the finest traditions of Confucian benevolence and are responsible for making the benefits of Traditional Chinese Medicine directly available to the common people. The average cost of a half hour massage and/or acupuncture treatment, including an herbal poultice, run at less than half of what it costs just to walk into a private doctor’s office in the West and say, “Ahhh”. Furthermore Dr. Hung charges less to those who cannot afford it and accepts more from those wealthy patients who willingly offer it. He won’t be found on the golf course on weekends, nor is the doctor ever “out”. Dr. Hung lives in a modest apartment directly above his clinic and answers patient’s calls anytime of day or night. For him, as for his Confucian forerunners, the practice of Chinese medicine is a full time commitment. This entry was posted in Tuina on March 2, 2013 by activehealth.ie.